Have you ever wished there was a way to lock your WordPress forms to prevent unwanted submissions? Or maybe you just wanted to limit the number of total form submissions you receive. Form locking is a popular feature request that we have gotten, and today we’re excited to announce that our Form Locker addon for WPForms is here! This is a great feature for anyone that wants to manage form permissions or add access control to reduce the number of unwanted form submissions. Let’s take a look at the features and what you can do with the Form Locker addon. The first thing you’ll notice after installing the Form Locker addon is that there is a new Form Locker menu item in the WPForms builder’ Settings section. Password. Require users to enter a password to submit their form. This added protection decreases the number of unwanted submissions you receive. Scheduling. Allows you to close form submissions after specific date or time. This is great for application forms. Entry Limit. If you’re wanting to cap the number of form submissions you receive, this is the setting for you. Define how many forms can be submitted and close the form after that quota has been met. This is perfect if you want to run a contest, giveaway, or sweepstakes. User. This feature can be used to hide your form from those that aren’t logged into your website. This allows you to create member-only forms. In addition to the new settings found in the form editor, the Form Locker addon comes with a unique answer feature that will further limit the number of form entries people can submit on your website. When you enable the Require unique answer feature on a form field, the same information cannot be submitted twice on two separate form submissions. For instance, if you’re running a contest and want to limit the entries to one per email address, then you can enable this feature on the Email form field. The great thing about the unique answer feature is that you can use it in conjunction with any of the other Form Locker addon settings. 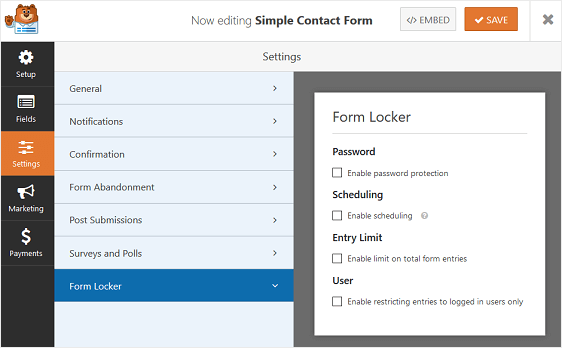 We hope you enjoy the new Form Locker addon for WPForms and find that locking or protecting your WordPress forms is easier than ever. I look forward to hearing if there is any immediate fix to this as it is affecting all our forms! That’s definitely odd, and we’d be happy to help! Could you please submit a ticket at https://wpforms.com/contact/ as soon as you have a chance? We’ll be able to assist much more thoroughly and quickly from there. hello! just wondering if we could do a reset to the schedule as well as entry limit? In most cases, it will work best to duplicate your original form (and make changes on this new, copied form) rather than altering your original form. The main advantages are that 1: You would be able to keep the entries completely separate (which is important to the entry limit, but useful in general) and 2: You don’t have to recreate each new form from scratch. In case it helps, here’s a screenshot showing how you can easily duplicate a form. How do you make a multiple choice question limited to one entry per user? 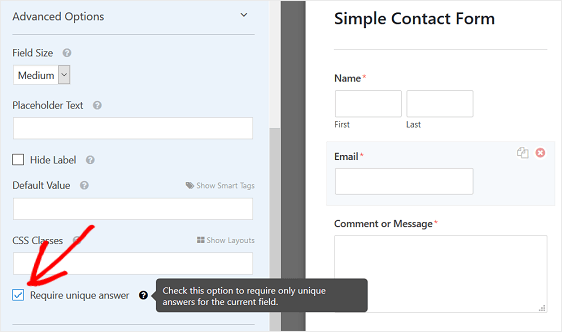 You can limit one form submission per user in general by going into the form builder, selecting a field (such as an email field) and requiring it to have a unique answer. If a user tries to submit a form by entering the same email address in that field, the submission will be blocked by the Form Locker addon.